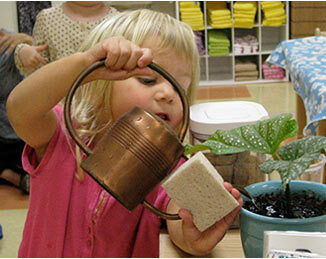 Montessori Children's House opened in September 2010 when a group of experienced educators joined to create this beautiful new preschool community in the heart of Portland, Oregon serving children 16 months through 6 years of age. The facility was expanded with new construction in summer 2014. We are located in the ground floor of the John Ross Condominium building in the South Waterfront District, directly across the street from Elizabeth Caruthers Park. Portland's South Waterfront is a community of diverse residents of all ages, a new neighborhood nationally known for its green building practices and diverse mass transit options. We have two classrooms of children 3 years through 6 years old (Montessori Primary ). Our Toddler community serves children from 16 months through 36 months of age. In addition to the specially prepared environments within the school, we make abundant use of the outdoors. 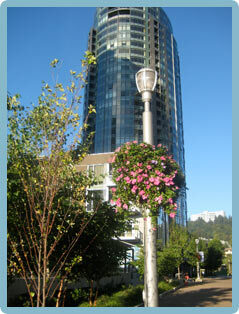 The adjacent park, South Waterfront Community Gardens, and the Willamette Greenway (featuring close-up views of the river and of Ross Island with its heron rookery) are all in close proximity. The children enjoy the park every day, and our own raised beds in the Community Garden get a lot of use in spring, summer, and fall. There are also attractive man-made spaces near the John Ross and adjacent buildings that utilize running rainwater and other natural features to create inviting courtyards for exploration and picnics. Feel free to contact us for more information. If you fill out the "initial information form," we'll have you on our list for announcements by email. Currently, we're fully enrolled for the 2018-2019 school year. Please call us at 503-360-1179 or click here, to get on our waitlist or for information about future enrollment opportunities.